Everteen Natural Intimate Wash comes in a transparent sturdy plastic bottle package with rose colour flip open cap. It is leak proof and safe to carry with us. The smell is very mild and smells like my kid's shampoo's smell. It is pale yellow colour runny liquid. I am using it regularly and feel very safe for intimate parts. This is SLS and paraben free and very mild to use it for everyday. This Everteen Natural Intimate Wash lathers well and keeps the delicate skin smooth and safe. I never felt any irritation or other things and I feel very safe by using this product on this delicate part. I feel fresh after every use. I suggest this product for every girl to keep their intimate part clean and hygiene. 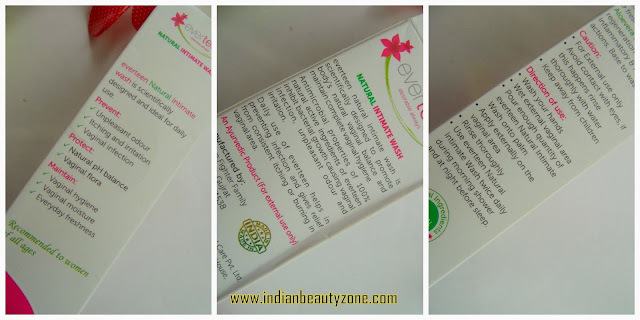 I am loving this Everteen Natural Intimate Wash's mild smell and using it regularly. Unhygienic habits of intimate parts may leads to severe health issues for women like small infections to cancerous danger. I feel always better to keep the them clean and hygienic than taking risks of health issues. Keeping our feminine part clean and hygienic is very important. Otherwise this will lead to severe infections and other health related issues. We need to learn this part of hygienic from our teen age. During monthly periods time you need to keep your feminine place very clean to avoid bad smell and infection. It is decently priced for the large quantity. This product is ravel friendly. It is mild for the skin. This feminine wash is suitable for all skin. It has mild smell and feels refreshing. It is best for everyday use. It is SLS, SLES free. None, but I feel personally it will be good if the brand is available in offline everywhere which is easy to buy. Otherwise it is a great intimate wash for all women. Everteen Natural Intimate Wash is a good everyday use intimate wash and safe for all skin, also SLS and SLES free. You can get it from Flipkart.com.